CPRE Cornwall is a supporter of renewable energy in principle because we want to help reduce CO2 emissions. However what at first seemed to be a good idea is now in doubt. Actual power output is nowhere near what was actually claimed at the outset. Furthermore wind energy and now solar panels are in danger of industrialising the Cornish landscape and wrecking our key asset – Cornwall’s coast and countryside. They may have a part to play but indiscriminate and random siting on unspoilt (now spoilt) hillsides, is not the way forward. The scale of this development in Cornwall exists primarily because of heavy taxpayer subsidies. Many landowners regard these as the new agricultural subsidy. The Daily Telegraph for example has publicised the fact that the Prime Minister’s father in law garners £1000 per day in subsidy for having turbines on his country estate. Nothing of course comes free. This subsidy is added onto our electricity bills and impacts especially on those in fuel poverty already. Most turbines and solar farms are overseas owned so taxpayer money floods overseas to Denmark, Sweden and Germany etc. When turbine applicants claim that a number of turbines will power say 100,000 homes they fail to mention that this requires that the turbines turn 100% of the time. On average they turn less than 25% of the time. So it is debatable that turbines save on carbon emissions. Wind and solar energy cannot be stored and output does not match well with demand. Without the contribution from nuclear power stations we would have to litter the whole of Cornwall’s coast and countryside with turbines to make Cornwall self sufficient and then provided the wind blew 24/7. 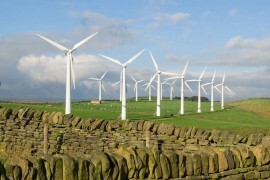 CPRE Cornwall is now being told by tourist providers that turbines are damaging their business. Tourists come to Cornwall to avoid blots on the landscape. We are informed also that house sales are now falling through when a once pristine view is blighted by these often massive installations. Decommissioning – currently there is no requirement for a wind turbine company/turbine owner to decommission /remove a turbine or solar farm at the end of its life in say 20/25 years time. We believe that owners should provide a bond or insurance cover so that Cornwall’s taxpayers are not left with the clean-up cost. CPRE Cornwall recommends the following way forward. Any contentious applications should be accompanied by a full environmental impact assessment (EIA) and all large applications should be accompanied by an EIA. We ask Cornwall Council to consider how much renewable energy is ‘enough’ before our coastal/countryside views are irrevocably damaged. In any case the electricity demand in Cornwall is lower than in most other parts of the country due to our warmer weather and lack of heavy industry. The feedback we receive from many who approach us is that currently Planning Officers are ‘nodding through’ applications without detailed consideration. We realise this is an emotive subject due to global warming but the CO2 argument simply does not stack up. Given the 400+ new applications in the pipeline in Cornwall, we believe that ‘Enough is Enough’.